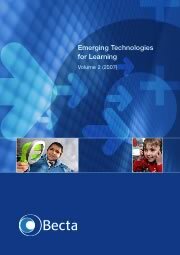 Emerging Technologies 3: This edition builds on and is intended to complement the previous volumes from 2006 and 2007. I am sure you will agree that we have some fantastic contributions from contributors who can only be described as world leaders in their field. E-safety and KS 1 and 2: This booklet refers to a selection of websites and resources that may help teachers of Key Stage 1 and Key Stage 2 teach e-safety messages in the classroom. There are other sources available – the number of e-safety websites is growing and their content is developing. Fuliflling the potential: This key government white paper looks to set the agenda from 2002-2006 on how ICT can be introduced into schools to support teaching and learning. Getting the most from your interactive whiteboard: A guide for primary schools: This guide is specifically aimed at senior managers and teachers in primary schools, and includes practical classroom examples and case studies. Getting the most from your interactive whiteboard: A guide for secondary schools: This guide is specifically aimed at senior managers and teachers in secondary schools, and includes practical classroom examples and case studies. 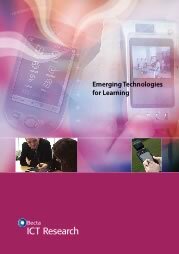 Harnessing Technology : Developing the idea of the e-environment and the 24/7 learning culture. Learning space and Virtual Learning Environments. ICT, amenability and the BBC digital curriculum service in England: Report on the subjects and key stages to be covered by the BBC in its Year 1 commissioning plans for England ICT and pedagogy - a review of the research literature: A summary of an extensive literature review carried out by Kings College London on behalf of Becta and DfES as a continuation of the work started by ImpaCT2. ICT Advice - Curriculum online and electronic learning credits: This addresses some of the frequently asked questions regarding Curriculum Online, the website and how e-learning credits work. ICT Advice - Support assistants and ICT: This contains general information on how support assistants can use ICT to aid in the teaching and learning of students with special educational needs. ICT Advice - Wireless Networks: This offers procurement advice on how to choose a wireless local area network and the issues to consider. ICT Advice - What are presentation technologies: This highlights the different types of presentation technologies available and draws out examples of effective practice in using presentation technologies in the classroom. IMPACT 2 : Summary of the important study on the use of ICT in raising school improvement. Making websites work (leaflet): Information on how to plan and design an effective school website. Managing Special Needs : This highlights the benefits of using ICT to support special educational needs and provides a starting point for choosing a solution appropriate to the requirements of an individual school. Personalising Learning with ICT: ICT has an important role to play in the delivery of personalised learning. This document sets out Becta's beliefs, and the steps we are taking to deliver the vision. Primary teaching: A catalogue of all Becta’s current advice and support services for primary teaching. This catalogue gives details of the online advice services, online tools, CD-ROMs and publications available for those involved in primary teaching. Safeguarding children in a digital world: This publication is intended to provide a strategic overview of e-safety issues to policy makers,and outlines a model for a co-ordinated approach by all of the key stakeholders.The guidance in this publication refers to policies and documentation related to England.However the principles discussed have resonance across the UK and beyond. Secondary Teaching: Advice and support services from Becta. Spring 2005 A catalogue of all Becta’s current advice and support services for secondary teaching. This catalogue gives details of the online advice services, online tools, CD-ROMs and publications available for those involved in secondary teaching. Strengthening Pedpagogy with ICT: This document looks at ways in which ICT can develop a range of pedagogic processes. Their Space : There are some powerful myths that inform the way people think about youth culture. This report sets out to challenge some of those myths, in order to explore the real value behind the digital interactions that are part of everyday life. This report is the result of nine months of work that focused specifically on understanding how children and young people use new technologies. Using digital video in teaching and learning: How to get started using digital video in the classroom. What the research says about barriers to the use of ICT in teaching: This report is based on an analysis of current research about barriers to the use of ICT in teaching What the research says about digital video in teaching and learning: This report is based on an analysis of current research about the use of digital video (DV) in teaching and learning. It summarises the key findings and suggests resources for further reading. What the research says about ICT and classroom organisation in schools: This report is based on an analysis of current research concerning ICT and classroom organisation in primary and secondary schools. It summarises the key findings and suggests resources for further reading. What the research says about interactive whiteboards : This report is based on an analysis of current research about the use of interactive whiteboards in teaching and learning. It summarises the key findings and suggests resources for further reading. What the research says about ICT and motivation : This report is based on analysis of available research about the motivational effects of ICT on students' commitment to and engagement in learning. It summarises the key findings and suggests resources for further reading. What the research says about ICT supporting special educational needs (SEN) and inclusion: This briefing is based on an analysis of available research about how information and communications technology (ICT) can support inclusive practice in schools. It summarises the key findings and suggests resources for further reading. What the research says about VLEs: This report is based on an analysis of current research about the use of Virtual Learning Environments (VLEs) in teaching and learning. It summarises the key findings and suggests resources for further reading.